A herniated or “ruptured” disc is a common source of neck pain and arm pain. Discs are the shock-absorbing pads that are between vertebrae, the series of small bones that make up your spine. Your cervical spine is located in your neck. At the cervical spine, the discs and joints allow your neck to move and provide stability for your head. The discs also act as a cushion to protect the cervical vertebrae. An opening in the center of each vertebra forms the spinal canal. Your spinal cord and spinal nerves run through the protected canal and send messages between your body and brain. A herniated disc occurs when its outer layer ruptures and the contents come out of the disc. If the contents extend into the spinal canal, it can put pressure on the spinal nerves. A herniated disc can cause shoulder, neck, or arm tingling, pain, numbness or weakness. It can also cause headaches. Most cases of herniated discs resolve with non-surgical treatments. However, when conservative treatments fail, surgery, called an Anterior Cervical Discectomy and Fusion, is recommended to relieve pain and restore function. The spine is divided into regions defined by their curvature and function. The cervical spine is located in your neck. The cervical spine supports your head and connects it to your trunk. The cervical spine supports less weight than any other portion of the spine. It also has the greatest amount of mobility and flexibility. Your neck can bend forward and backward or tilt from side to side. Your neck can also turn or rotate to the right and left, a motion used when checking for traffic before crossing a street. Seven small vertebrae make up the cervical area of your spine. Vertebrae are the series of small bones that align to form the spine. The back part of the vertebra arches to form the lamina. The lamina creates a roof-like cover over the back opening in each vertebra. The opening in the center of each vertebra forms the spinal canal. Traveling through the protective cervical spinal canal is your spinal cord, spinal nerves that travel to your arms and hands, and arteries that supply blood. The top section of the cervical spinal canal is very spacious. It allows more room for the spinal cord than any other part of the vertebral column. The extra space helps to prevent pressure on the spinal cord when you move your neck. Intervertebral discs are located between the vertebrae in your cervical spine. The discs are made up of strong connective tissue. Their tough outer layer is called the annulus fibrosus. Their gel-like center is called the nucleus pulposus. The discs and two small spinal facet joints connect one vertebra to the next. The discs and joints allow movement and provide stability. The discs also act as a shock-absorbing cushion to protect the cervical vertebrae. As we age, our discs lose water content. Our discs can become shorter, less flexible, and less effective as cushions between the vertebrae. When a disc deteriorates, the outer layer can tear. A herniated disc occurs when the outer layer ruptures and the inner contents, the nucleus pulposus, come out of the disc. If the inner contents of a herniated disc extend into the spinal canal, it can cause pressure on the spinal nerves. When the inner contents come in contact with the spinal nerves, a chemical reaction occurs. The spinal nerves become irritated and swell, resulting in pain. A herniated disc can also cause pressure on the spinal cord. Herniated discs are more common among people that are middle aged. Older adults are at the greatest risk for herniated discs because of their decreased disc water content. Other risk factors include being overweight and smoking. Using poor body posture when lifting or performing repetitive strenuous activities can also cause discs to rupture. Additionally, a disc can rupture after sudden pressure, even if it is slight. This can occur from trauma during violence, motor-vehicle crashes, or from a sports-related injury, such as football or surfing. Neck pain is a common symptom of a herniated cervical disc. You may feel shooting pain in your arms. You may experience pain or burning pain in your shoulders, neck, and arms. Your arm may feel weak, numb, or have a tingling sensation. You may also get a headache. In rare cases, the loss of bowel and bladder control accompanied by significant arm and leg weakness indicates a serious problem. In this rare case, you should seek immediate medical attention. Your doctor can diagnose a herniated disc by performing a physical examination and viewing medical images. Your doctor will ask you about your symptoms and medical history. You will be asked to perform simple movements to help your doctor assess your muscle strength, joint motion, and stability. Since some of the nerves from the cervical spine travel to the arms, your doctor will perform a neurological physical exam to see how the nerves are functioning. Your doctor will order X-rays to see the condition of the vertebrae in your cervical spine. Sometimes doctors inject dye into the spinal column to enhance the X-ray images in a procedure called a myelogram. A myelogram can indicate if there is pressure on your spinal cord or nerves from herniated discs, bone spurs, or tumors. Your doctor may also order Computed Tomography (CT) scans or Magnetic Resonance Imaging (MRI) scans to get a better view of your spinal structures. CT scans provide a view in layers, like the slices that make up a loaf of bread. The CT scan shows the shape and size of your spinal canal and the structures in and around it. The MRI scan is very sensitive. It provides the most detailed images of the discs, ligaments, spinal cord, nerve roots, or tumors. X-rays, myelograms, CT scans, and MRI scans are painless procedures. In some cases, doctors use nerve conduction studies to measure how well the cervical spinal nerves work and to help specify the site of compression. Doctors commonly use a test called a Nerve Conduction Velocity (NCV) test. During the study, a nerve is stimulated in one place and the amount of time it takes for the message or impulse to travel to a second place is measured. Your doctor will place sticky patches with electrodes on your skin that covers a spinal nerve. The NCV may feel uncomfortable, but only during the time that the test is conducted. An Electromyography (EMG) test is often done at the same time as the NCV test. An EMG measures the impulses in the muscles to identify nerve problems. Healthy muscles need impulses to perform movements. Your doctor will place fine needles through your skin and into the muscles that the spinal nerve controls. Your doctor will be able to determine the amount of impulses conducted when you contract your muscles. The EMG may be uncomfortable, and your muscles may remain a bit sore following the test. Many people with herniated discs can be treated with non-surgical methods. Over-the-counter medication or prescription medication may be used to reduce pain. These may include steroids or nonsteroidal anti-inflammatories. Your doctor may recommend that you rest for a few days. You may wear a soft neck collar to provide support. Occupational or physical therapists can provide treatments to reduce your pain and muscle spasms. The therapists will also show you exercises to strengthen your neck muscles. Following surgery, your doctor will initially restrict your activity level and body positioning. You should avoid lifting, housework, and yard-work until your doctor gives you the okay to do so. You will wear a neck brace for support. You will gradually increase your activity level. Once your neck has healed, physical therapists will teach you flexibility and strengthening exercises. You will also learn body mechanics, proper postures for your spine to use when you stand, sit, and lift objects. Surgery is recommended when non-surgical methods have provided minimal or no improvement of your symptoms. Surgery may also be required in cases where a herniated disc is pressing directly on a nerve or the spinal cord and causing loss of function. An anterior cervical discectomy and fusion is the type of surgery most frequently used for a herniated cervical disc. An anterior cervical discectomy and fusion involves removing all or part of a herniated disc or discs. The surgeon also fuses or secures two or more vertebrae together to stop movement and relieve pain caused by the disc herniation. The surgeon performs the surgery through a small incision on the anterior or front part of the neck. Your surgeon will make an incision approximately two inches long on the front of your neck, carefully avoiding your throat and airway. Your muscles and arteries will be moved aside with care to allow access to the vertebrae. 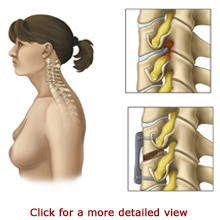 Your surgeon will remove all or part of the herniated disc. Next, the surgeon places a bone graft or interbody fusion cage in the empty disc space. A bone graft consists of bone taken from your own body, usually from the pelvis, or an allograft taken from a donor. The bone grafts are placed between the vertebrae. An interbody fusion cage is a small container that is filled with bone shavings and placed between the vertebrae. The bone grafts are surgically secured to the spinal column with surgical hardware, such as screws and plates. 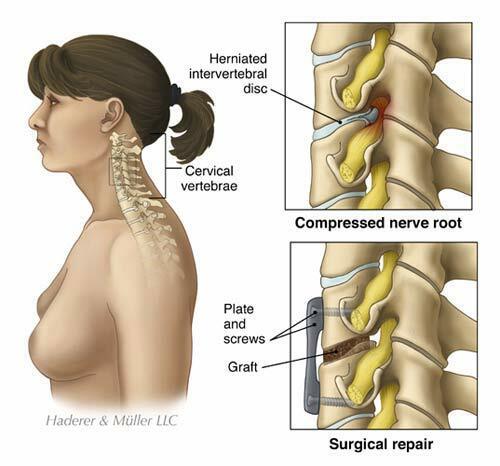 The surgical hardware secures the vertebrae together and allows the bone grafts to heal, fusing together the vertebrae. At the completion of your anterior cervical discectomy and fusion, your surgeon will close your incision with stitches. You will receive pain medication immediately following your surgery. You will wear a neck brace or collar while your fusion heals. You should expect to stay overnight in the hospital. You may need a little help from another person during the first few days or weeks at home. If you do not have family members or a friend nearby, talk to your doctor about possible alternative arrangements. Your doctor will initially restrict your activity level and body positioning. You should avoid lifting, housework, and yard-work until your doctor gives you the okay to do so. You will wear a neck brace for support. You will gradually increase your activity level. Once your neck has healed, physical therapists will teach you strengthening exercises. You will also learn body mechanics, proper postures for your spine to use when you stand, sit, sleep, and lift objects. The recovery process is different for everyone. It depends on the type of surgery that you had and the extent of your condition. Your surgeon will let you know what to expect. Generally, the recovery time for an anterior cervical discectomy and fusion is several weeks. Your arm pain should go away fairly quickly; however, it may take weeks to months for your arm weakness and numbness to resolve. It is important that you adhere to your restrictions and exercise program when you return home. You should use proper body mechanics during all activities. Do not smoke. Smoking increases the risk of surgical complications and hinders the bone from fusing.